I sometimes think about how much I work out and wonder if people who know this about me wonder why I haven’t gone through some kind of dramatic weight loss transformation. And if we’re being honest, I sometimes wonder this about myself. But before you @ me with weight loss advice or start interrogating me about my diet let me stop you. I’m not in the game to change my body, I’m in the game to change my mind. But what I didn’t expect was that working out would dramatically change my mind about my body. The main reason I exercise is emotional. Two years ago I got back into working out at a time when my personal life, finances, and living situation got unexpectedly uncertain very quickly. My live-in best friend decided out of the blue to quit his job and buy a one way ticket to California. It was as if the board game of my life had been flipped off the table in a blind rage. At first I started going to fitness classes because I was mad and needed both an outlet formy anger and an excuse to be out of the apartment and avoid him in the two weeks before he left. Then, once he was gone, it gave me something to focus on other than the fact that I had no one to talk to when I got home everyday. But after that specific situation was over, I kept going. I ramped up the frequency again after the 2016 election to cope with the terror and grief I could feel building in my body, and once again, even though some of those feelings decreased in intensity, I kept going. My motivation has never been about changing my body, but sometimes I wonder if it should be. But then I ask myself why? Is it something I truly care about? Do I think being smaller would make me better? Is there a true medical necessity? Is it societal beauty standards manifesting as a critical voice in the back of my head? Then I also ask myself what I would do differently if it was what I really wanted and if it would be worth it. Whenever I think about losing weight I remember the time my mom took me to a family weight loss program called Shapedown. There were four families in the program, of which mine was the narrowest. Every week we would meet in a room at the local hospital, step on the scale, then record our weight in a workbook. The facilitators would review our food and exercise journals and give us feedback. I remember their rules were not to eat any foods that had more than 3 grams of fat (LOL) and then they would suggest that, as family units, we all try to go on a daily 30 minute walk for exercise. The walks were certainly not bad advice from a health perspective, but I knew for certain that a 30 minute walk was not going to be the key to my weight loss success. At the time, what I learned from my exercise journal was that I was basically exercising like it was my job. Between all of my summer sports and activities I was active for about 35 hours a week and my weight remained unchanged. I was taking dance classes, swimming, riding horses, and playing soccer. I literally showed up to soccer practice still covered in horse hair from the barn or got to my riding lessons fresh from the pool. Being active was not an area that was lacking. I think for some people this might have been discouraging, but my main takeaway from the experience was that my body was probably the size it was supposed to stay. I can’t lie and say having that epiphany made me suddenly confident in the way my body looked—it definitely didn’t. But I did have a vague sense that I had sort of pushed the limits in terms how many hours a person could exercise in a week and yet it had not made me thin. I figured the other option was to starve myself, but after some consideration, I decided I was not particularly interested in pursuing an eating disorder so I didn’t. 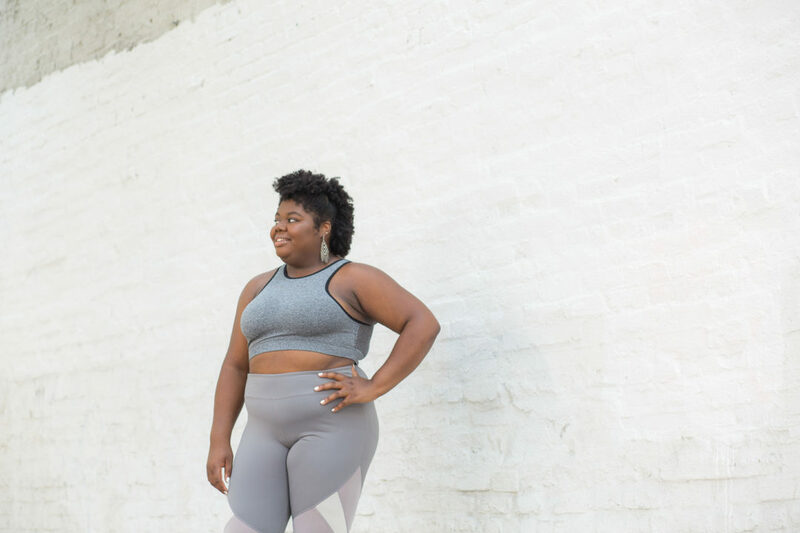 I struggled with body image throughout middle school, which was exacerbated by a very strict private school dress code, for which I could not find many attractive—let alone trendy—options that fit my body. My peers had matching outfits from Abercrombie or Hollister, while I tried to hide in my ugly polo shirts from JCPenney. Then in high school I hid behind my identity as an athlete and used it as an excuse to wear mainly athletic clothes before athleisure became an actual category of fashion. I went through some different phases of clothing in college, ranging from layering two t-shirts to make it look like I was making an effort to “I haven’t slept enough to care what I look like.” Mainly, though, I ended up dressing like a teenage boy because teenage boy clothes came in my size. It wasn’t until a few years ago that my friend Kate showed me that a person could be my size and also wear cute clothes. I was not destined to dress like a teen boy forever! But even knowing that and learning more about the Body Positivity and Fat Acceptance movements, I still didn’t feel confident in my body. I honestly didn’t think I ever would. Over the last few months, though, I noticed an unexpected change. Sometimes I would walk past a mirror and feel good about the way I looked instead of cringing at myself. At first I was excited at the idea that I may have lost weight, but when I finally made my way to a scale, it turned out the opposite was true. I also hadn’t changed size in any meaningful way: all of my clothes still fit pretty much the same way they always had. At that point I realized it wasn’t my body that had changed, it was my perception of my body that had changed. I felt myself getting stronger, faster, and more flexible so I felt good in my body instead of criticizing it. Instead of seeing my body as a problem, I was able to see it for what it could do. When I learned about Body Positivity a few years ago I intellectually understood the idea that my size didn’t preclude me from wearing certain clothes, but I still didn’t really believe it for myself. 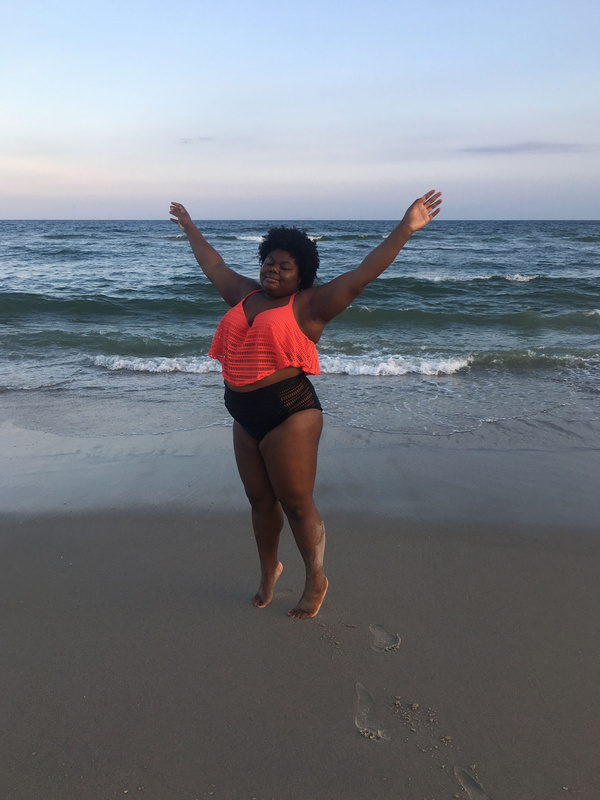 I saw larger women on Instagram wearing body con dresses and crop tops, I envied Kate’s cute bikinis when we went to the beach, but I didn’t see those things as a possibility for myself until my perspective changed. To be clear, I’m not saying that anyone has to exercise in order to feel comfortable with their body. A lot of people say “I’m all for body positivity as long as you’re healthy.” They expect people in larger bodies to prove that they exercise, that they’re on a diet, or that they’re in some way performing “health” in order to justify the body they live in. That’s not what I’m trying to endorse here. The reality is that, to the outside observer, I’m still the same size that I was before I started hitting the gym—and even 10 pounds heavier. Whether I decided to wear a crop top today or two years ago it would look the same from the outside. The only thing that has changed has been on the inside. This summer I didn’t have a traditional “summer body” but it was the first time that I took some of the crop tops I’d been hoarding out for a spin in public. It was also the first time I tried on a bikini and then actually bought it and wore it to the beach. It was the first time I really felt at peace with my body. This body that looks exactly the same as it has for the last 20 years. I found you through your Peloton posts and I’ve been struggling mentally with what it means that I’m exercising more and not losing weight. This post was so inspiring about what my journey going forward could look like, as I try to get stronger and more comfortable with my body! Thank you for your great blog.